The original “Naturals” dog treats were created in 1996 by a loving pet owner in need of a healthy treat alternative for her allergy sensitive pet. She soon discovered that many other pet owners were looking for the very same thing and so she began selling her homemade dog biscuits to a local pet boutique, garnering a loyal following. After more than twelve years of baking, it was time to retire. So now what?! Well, that’s where I stepped in. My name is Bentley and I was raised on these “Naturals” treats. Knowing my obsession for these healthy snacks my human contacted the original baker, bought the recipes, and is now working with a local baker and his family, so I can continue to have the same healthy, delicious treats I’ve grown to expect. Same excellent quality. Only the name has changed. (And a good choice, in my opinion!) 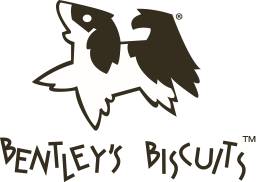 So the original “Natural” dog treats of Scottsdale, Arizona are now “Bentley’s Biscuits”!